People go to Mt. 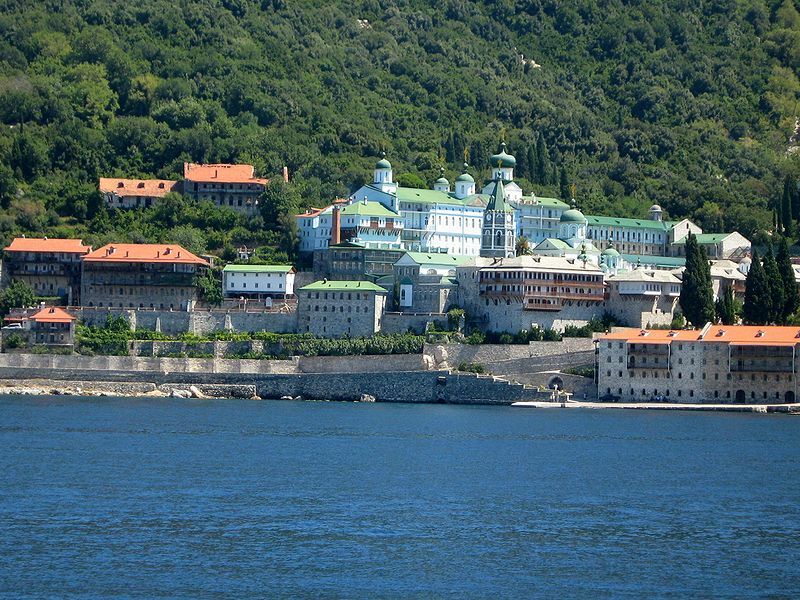 Athos – The Holy Mountain – in Greece for many reasons, to visit or even become monks and live the quiet life of reflection. They go to escape the material world, briefly or forever, to find God or themselves, to retreat within and find answers in retrospection in hopes of getting closer to fine. Father Ioanikios gave up the good life in Manhattan, living large in the country where as a Greek he had come an American citizen, roaring around in his 20s, working for Mobil Oil in New Jersey, commuting there from his apartment on 32nd Street between Madison and Fifth Avenues. He had gotten his Master’s Degree in economics and all the world was his oyster but he wanted a pearl and said he found it on Mt. Athos, telling the tale to Simon Critchley, an English philosopher who teaches the subject as a Professor at New York City’s New School for Social Research. Father Ioanikios told Critchley when he was living in Manhattan that he had a small icon of the Virgin Mary to which he would pray before going to sleep, even if he was, a bit hypocritically, a tad tipsy from drinking too much and indulging in worldly pleasures while seeking absolution, if not Absolut too. He was set. Then, in the early 1980s on a trip to see his family in Greece, he visited Simonopetra on Mt. Athos, a monastery also called Simon’s Rock founded in the 13th Century. On his visit, Critchley said the monks found it amusing he had the same name as the simple, bare, cold cave named for a hermit who lived there 700 years ago. Father Ioanikios’ grandmother’s brother had been a monk on the mountain so the converted New Yorker visited the cell of an old and very ill monk who knew his relative well, he told Critchley, and was left with a wordless encounter that changed his world when he was back in The Big Apple thinking about it. “The old monk had such life in his eyes. Such love,” he said. He couldn’t get the experience out of his mind, he said, so he returned to the monastery and decided to leave behind the bright lights and big city and the booze and became a novice in 1984 and a monk in 1987 and stayed. His name had been Christos, now it was Ioanikios, after a 9th Century Byzantine saint. For all his insight and devotion, Father Ioanikios is not an intellectual or a theologian but a practical man with a Toyota four-wheel drive truck who takes care of business operations, building projects. |But he is a person of deep and convincing faith. He told me that he frequently prays in the forest because he feels comfortable there,” he told his philosopher visitor. “It’s the Garden of Eden,” he said. “Looking out of the window at the forest, mountains and blue sea, I sighed in agreement,” wrote Critchley. Father Ioanikios said he’d become a monk and came Simonopetra because, “He felt called by God and had responded to the call. Not all are called by God and not all who are called respond. But he did.” And still does. Critchley also discovered on Mt. Athos the diligence and drive needed to live a simple life, awakening at 4:30 a.m., singing vespers, devoting yourself to a lifetime of religion and faith and not what money can buy, apart from a Toyota needed to get around. No women are allowed, showing the strength of Father Ioanikios after being surrounded by them in New York City, along with all the other temptations the city offered young men. “The father told me that some of younger, keener monks often get up at 11 p.m. to extend their devotions. There is at least one hour of Bible reading, one hour reciting the Jesus Prayer or the Prayer of the Holy Mountain (‘Lord Jesus Christ, have mercy on me,’ repeated rhythmically over and over again) and one hour of prostrations. The amount of prostrations depends on your age and physical ability, but there should be at least 120; some monks perform up to 2,000. This rather put my Pilates classes into perspective,” wrote Critchley. Mt. Athos follows the old clock of Byzantium, where the day begins at sunset. After the morning service, monks can nap for two hours. This is followed by a service of 30 minutes, then lunch, the main meal of the day, at 10:30. Meals in the refectory are taken in silence and one can eat only when the head of Simonopetra, Abbot Eliseus, rings the gold bell he has beside him. When a second bell rings, it is permitted to drink either water or a sole glass of sweet red wine from their own vineyards. Meal times are fast, about 20 minutes or so, and you have to eat quickly. Throughout the meal, a monk reads aloud from a text, an ancient version of staring at your cell phone perhaps. He said the monks faces during a service “were transformed and elevated by song. It is impossible to describe what it was like to be there, but the sheer duration and intensity of the services had a powerful effect,” even on him, struck by the seriousness and absence of piety. “What struck me during my stay at Simonopetra was the constant emphasis on monasticism as a living experience, as an unbroken continuity of tradition. In the case of Athos, that means at least 1,000 years. In this place, every day without exception, the rituals have been followed. Monasticism is not a theology; it is a way of life,” said Critchley, whose life has been studying the philosophy of life.